THE mass shooting in Munich last night, in which 10 people lost their lives – including the gunman – and many others were wounded, has been designated as an “amok” shooting, not a terrorist attack. The German work “amok” describes an indiscriminate rampage shooting by a perpetrator that is motivated by reasons other than organised terrorism. The police have discovered no indication that the shooting was an Islamist or Isis terrorist attack. The identity of the gunman has not yet been released, but he was an 18-year-old German-Iranian who was born and grew up in Munich. 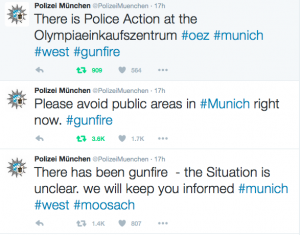 First reports of the shooting arrived at the Bavarian police at 17.52 yesterday evening. The police quickly closed off the scene of the crime at the Munich shopping centre Olympia Einkaufszentrum, all public transport in the city was shut down soon afterward. There were reports of other attacks in the city, which the police also investigated, but none of these proved to be real. Residents were asked to stay at home, not to remain in public spaces and get off the streets. Extra police reinforcements came from all over Germany, also from Austria. More than 2,000 police officers were involved in the operation. The police kept people informed on Facebook and Twitter, tweeting in five languages – German, English, French, Spanish and Turkish – to keep people informed. They also used Twitter to ask people not to post pictures of the gunman or the police, as this would interfere with the success of the operation. Initial reports stated that up to three perpetrators were at large. Apparently plainclothes police gave chase initially and were seen by witnesses, who then informed the police that they had seen three armed men fleeing. Because so many reports were coming in – Bavarian police commissioner Hubertus Andrä said in a press conference at noon today they had received 4,310 in six hours yesterday evening, the amount they might normally get in four days – they were unable to correctly interpret the information. Hours after the shooting, a body in a side street near the OEZ was identified as the gunman. He had died from a self-inflicted gun wound and, although he had been shot at by the police, none of these had hit him. The 18-year-old gunman had a 9mm Glock; at the moment there are no indications that anyone knew he had a weapon. Police are currently investigating how got it. After searching the gunman’s room at his family home, the police found newspaper articles and other literature about mass shootings. The perpetrator was obviously took a great interest in them. According to Bavarian police commissioner Andrä, as he was so interested in mass shootings, he must have been aware of and studied Breivik’s attack as well. There are also reports that he was interested in violent video games, and of a possible psychological illness. During the press conference, police commissioner Andrä also said that there had been definitely only one perpetrator, and that the gunman had, according to the investigations they had been performing since he was identified, there were no connection between him and the refugee situation. His family are established Munich residents: his father a taxi driver, his mother a shop assistant. The family lives close to Stiglmaierplatz in the centre of Munich. The gunman was not known to the authorities. He was still a student, but the police have not released any information about which school he attended. There are reports that a Facebook account, possibly hacked by the perpetrator, offered free food to people at fast-food restaurant McDonalds on that day. Most of the victims were young people: three 14-year-olds, two 15-year-olds, and a 17, a 19, a 20 and a 45-year-old. All were from Munich; three of them female. A young woman, a neighbour, said on Bavarian television that she understands people are frightened, but that Muslims are also frightened, and that attackers like that don’t make distinctions. The police and Bavarian state ministry have held press conferences; Chancellor Angela Merkel is due to hold a press conference this afternoon.